The GPS on the DeHaviland Otter we’re flying is showing “Danger – Terrain Ahead” in white letters on a red background. It’s the type of message that usually serves as a precursor to slamming into the ground in a fiery explosion. And indeed, as we fly over the Pika glacier there’s a giant face of rock, snow, and ice looming not just ahead of us, but above us……. To Rico, our pilot, however, this is clearly just another day at the office. Escaping a fiery death, we continue up the Kahiltna Glacier. Mt. Hunter’s West Ridge, our objective, comes into view, and it’s only then that the magnitude of what we’re trying to accomplish hits me: this isn’t the northeast, or even the Rockies – Mt. Hunter is absolutely enormous; and we’re going to try to climb it?! This expedition began as the brainchild of Al and John, but who would become part of our team was an expedition in itself. Al invited me to join in the summer of ’09, and I of course said yes, knowing full well that there was no way I’d get time off from work to do it. John and Al were in though, and maybe Henry would be able to round out the team. None of us had been to the greater ranges before, so really a team of 3 would be necessary. I mulled over when to ask the Head of School and Director of Studies to allow me the 2 weeks off for the trip, procrastinating and putting off the inevitable “no”. Finally, in early October I approached them about it. After a few meetings going over our plan, what it meant for me in terms of my interests, and how I could tie it into my work at Darrow School, they made their decision – I was in! So, it would be me, John, Al, and maybe Henry? 4 would make for a greater margin of safety and more legs to break trail and carry gear. Unfortunately, this wasn’t going to happen. John was out. Family emergencies and the bite of reality meant that he would not be able to make it. That left Al and I, wondering whether Henry would be able to make it, or whether we’d have to change our objective. Henry had his ticket though, so he was in. Our team was set, and our focus could shift from whether it would happen to how to make it happen – it was time to start training. The three of us all had our own ways of training for the trip. For Al, this being a continuation of an already noteworthy mountaineering career, there was a tried and true method – daily exercise, long hikes, and even longer hikes as benchmarks along the way. There was no doubt he’d be ready. Henry, living in the mountain town of Chicago, had his own training regimen: a 70-pound pack and a 35-foot hill. Up and down, joining the crowds of elderly couples and moms with strollers. He’d trained for mountaineering before though, so he knew what it would take. Now the amount of time I’d spent on glaciers could best be measured in minutes at that point, and my previous mountaineering experience was limited to winter ascents on Mt. Katahdin and some formal mountaineering training with NOLS several years ago. I did not have a wealth of experience to draw on, so I was damn well going to be prepared physically! Tapping into my more obsessive qualities, the training section of Mark Twight’s Extreme Alpinsim was my bible. I spent the fall building a foundation and began building strength. I spent countless hours in the gym through the fall and early winter. I was going to be fit – there was no doubt about it. Unfortunately, 2 bouts with walking pneumonia that winter shattered any illusions I had about following my selected path to mountain fitness. If I was going to make up for my lack of experience by being fit I was going to need help. I had about 9 weeks to go before my trip, I was coming off of pneumonia round 2, and my plan was not going to work. Thus, I sought professional help. I contacted Matt McCormick, a Burlington area climber with a background in exercise science and general alpine bad-assness. He’d understand what I needed to do with my limited amount of time. Thus my plan shifted and I followed a regimen of Olympic lifting, running, stairs, and an especially devious plyometric routine called “Super Legs”. I HATE “Super Legs”. How is it that something that involves no weights, only the weight of your body, can be so painful? But they work, and by the time I left, I was confident that I was ready for the mountains. Of course this confidence dissipated upon seeing Mt. Hunter for the first time. Flying up the Kahiltna and landing below it at Kahiltna Base Camp, or more colorfully, Kahiltna International Airport (KIA), I had serious doubts. Hunter towers 8,000 feet above KIA… What was I doing there? Collecting our fuel from the base camp manager and rigging sleds put our minds to the task at hand, however, and within an hour we were off – heading down towards the main body of the Kahiltna Glacier. A hard left, a few crevasses to negotiate (Henry was especially adept at finding them… by falling in of course), and a few hours later we were at our advanced basecamp below the start of the West Ridge. Now, all we needed was some good weather and we’d be on our way. Tuesday, our second day on the glacier, was not the bluebird day we were hoping for. Thus we practiced what would become an invaluable skill over the next two weeks – camping out. Wednesday looked like it would be slightly better though, and we remained optimistic. The weather forecast Wednesday wasn’t ideal (no prolonged period of high pressure), but we were anxious to do something and it seemed like it would be good enough. Up we went. Under ideal conditions, we should at least have been able to climb to a good camp at 9000 feet from our camp below the ridge at 6500. The West Ridge is a 4.5-mile long ridge that gains a total of 8,000 feet of elevation. If we moved really fast, perhaps we could even get to the base of the rock band about 1/3 of the way up the ridge. We were not really fast. 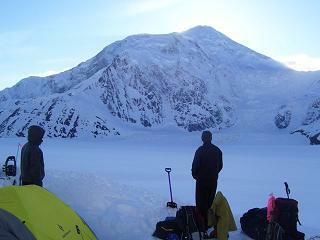 We ran into deep powder from the very start, and after ascending the icefall that guards the approach to the ridge itself, we made our first camp around 8500 feet. After one day we were already well behind where we hoped we would be. Fortunately, being the gumby big-range mountaineers that we are, we had brought way more food and fuel than necessary so we could afford to be slow. Thursday broke with clouds and snow – just what we needed, more powder to add to the knee-deep powder that already existed on the route. Several hours of hard-fought travel led to about 500 feet of elevation gain over probably half a mile. We were at the good campsite at 9000 below the Cats’ Ears, two rock pillars from which we’d have to rappel to gain the narrow, corniced ridge ahead. We made camp and headed up to the Cats’s Ears to prep the rappel anchor and stash gear for the next day. Little did we know that this would be as far as we got on the West Ridge. More bad weather, including a foot of new snow in one day pretty much killed any chance we had of continuing along the ridge. Each time we went up to the Cats’ Ears we’d look along the ridge ahead, only for clouds to move in and obscure the line that would mark where the ground ended and the 3-4,000 foot drop began. We’d negotiate changes in our plan with each other while tent-bound: “Let’s get at least to the rock band so we can climb the Beckey Chimney” (the crux of the route), or “We should continue at least to the ice shield” (just below the end of the ridge where it meets the summit plateau). But ultimately, this was all fantasy. The new snow pretty much guaranteed we wouldn’t be heading up. Ironically, Sunday morning was a beautiful day, but it was time to go down. Conditions weren’t cooperating and we were beaten, the West Ridge would have to wait for another day, and perhaps a party that was better prepared and more patient. Several hours later, after plodding down slopes with snow that was up to our hips at times, we were back at our advanced base camp and debating what to do next. The next morning, as we packed up to head back to KIA, we met two other parties. One had been trying the Northwest Basin variation to the West Ridge, but had been camped out for the better part of 2 weeks due to the conditions. 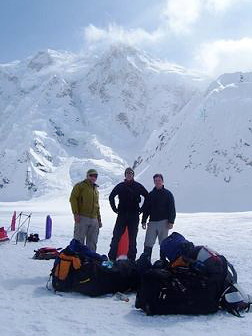 The other came over from KIA to start up the West Ridge – they had been camped there for 12 days waiting for a high-pressure system (which was of course just starting as we came down). 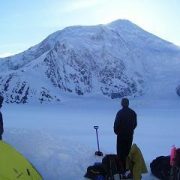 Apparently waiting is the name of the game in Alaskan mountaineering. Not motivated to try the West Ridge’s deep powder again, we slogged back to KIA (which, being uphill in this direction, was not nearly as fun as getting out to our camp below the West Ridge) to assess our options. Unfortunately, our options were pretty few. Most of the other mountain routes in the area were likely to have the same deep powder we’d run into on Mt. Hunter, while our secondary objective, the Mini-Moonflower Couloir (a steep ice flow on the flanks of Mt. Hunter), was not in climbable shape. The crux pitch had only enough ice for one party to pass, and a very strong French team had climbed it a few days before. With few good options it seemed on the Kahiltna, what is one to do? Fly out of the Kahiltna and over to the Ruth Glacier of course! The Mountain House landing strip on the Ruth Glacier is only about 7 miles east of KIA, but it’s a completely different world. 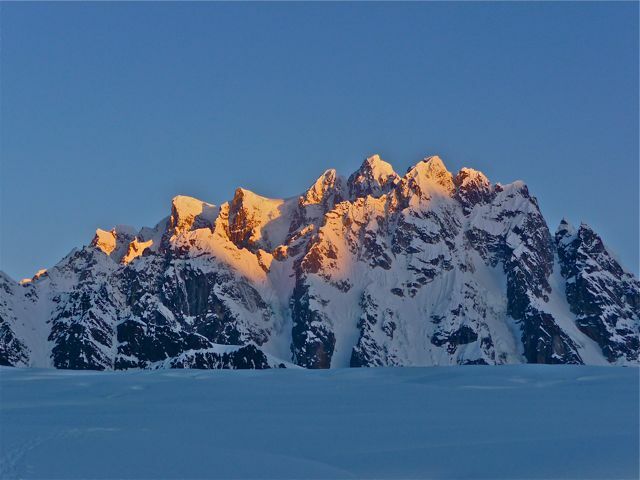 Whereas the Kahiltna is dominated by the 3 giant peaks of Denali, Foraker, and Hunter, the Ruth is home of peaks in the 7-11,000 foot range with walls of steep granite. With the possibility of worsening weather forecast for Wednesday, we made ourselves a comfortable camp by the airstrip when we arrived at the Mountain House on Monday and made plans to attempt the Japanese Couloir on Mt. Barrill Tuesday evening. Rolling out of camp Tuesday morning before the sun softened the snow on the glacier, we arrived at the base of the Japenese Couloir around noon. After a few hours of hydrating and resting, we headed up around 2pm. The Japanese Couloir flew by in three blocks of simul-climbing up steep snow up to about 50 degrees. The snow was soft enough to preclude needing crampons but firm enough that we weren’t rehashing the vertical swimming we experienced on the Kahiltna. Above the couloir itself, a 350’ traverse over a steep snow slope through sun-baked slush guarded access to the summit ridge. Leading out, I jokingly called it the “Brown Pants Traverse”, but in reality rock pro every 50-75’ or so made the traverse seem almost casual, and around 8:40pm we reached the summit. Our descent from the summit back to the Japanese Couloir went smoothly, and we began to rappel back down the Couloir. After the first rappel, however, Al decided he wasn’t psyched by the rap anchors and we began to simul-downclimb the couloir. In retrospect, the anchors were fine (what looked like some webbing pinched into some cracks actually was two solid-looking pins covered in snow), but the down-climbing added some spice to the route. After down-climbing the upper couloir, one final rappel put us onto lower angled snow and we flew down to the base of the couloir, descending nearly a thousand feet in a matter of minutes. After rolling into camp around 6, we took a rest day and set our sights on a new objective: the West Ridge of the Mooses Tooth. Viewing the route from Mt. Barrill, it was unclear whether or not the crux of the route was in climbable shape, but we decided it would be worth giving it a shot. Taking advantage of the cooler temperatures to travel over the Ruth, we left around midnight and quickly found ourselves below the icefall guarding access to the ridge itself. There was considerable debris below the icefall, but the snow conditions made it all but impossible to climb the slope except in the blocky debris. 45 minutes of slogging moved us out of the danger zone, however, and onto the slopes above. Although the Ruth lacked the deep powder we found on the Kahiltna, climbing the Mooses Tooth brought a new challenge: breakable crust. The snow consisted of a firm layer on top, but for the most part it was not strong enough to hold one’s weight. Thus, each step turned into a jarring crash into the deep, less consolidated snow below the crust. After an hour of this slow progress, and one near miss in a crevasse, we were through, and headed back down towards camp. With poor weather forecasted for the last few days of our trip, we decided we’d had enough and would head out of the range. Ultimately, it was disappointing to fail so spectacularly on the West Ridge of Mt. Hunter, but it was a good learning experience for future expeditions in the great ranges. Meeting parties that had waited up to 2 weeks for a good weather window made it clear we were far too impatient to tackle such an ambitious line. Furthermore, slogging around in snowshoes was obviously inferior to skiing. Hopefully we can take these lessons and apply them to future expeditions, be it a return to the Ruth or Mt. Hunter, or an attempt of Denali’s West Rib.